X-Men Monday (featuring Jordan D. White) #3 – Excalibur, Mammomax and single Cyclops – AiPT! Plus, your first look at the cover to Uncanny X-Men #19! 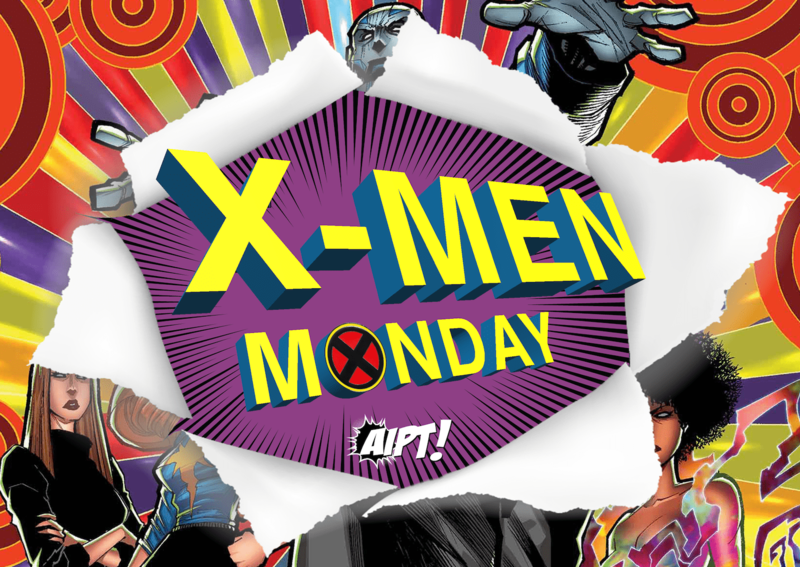 Welcome, X-Fans, to another astonishing edition of X-Men Monday at AiPT! Just like Cyclops in last week’s Uncanny X-Men #13, we’ve got a pretty big to-do list to get through (which includes an eXclusive first look at the cover to Uncanny X-Men #19), so let’s cut the chit-chat and get to it! First, if you read last week’s X-Men Monday #2 (already on its third printing! ), you’ll know that our friend, X-Men Senior Editor Jordan D. White, asked which pop star Dazzler is the Marvel version of. Jordan: Debbie Harry, Lady Gaga and Kylie Minogue are definitely ones I had heard before, but I don’t think I have ever heard anyone compare her to Christina Aguilera before, or Pat Benatar. Fascinating. One thing I think is funny about Dazzler is that with Marvel time, she first appeared on the scene in something like… I don’t know, 2007, maybe? So her whole disco look was actually a retro act. AiPT! : Funny you bring up time, Jordan, as many of this week’s questions focused on days of X-Men’s past. You’ve been pretty vocal about your love of a certain whimsical X-book that launched in the late ’80s. Perhaps that’s why Christopher‏ (@ckgarcia07) asked: What do you think of an Excalibur relaunch? Jordan: I think it would be great. That said, it’s definitely a thing that is tricky. What was it that made Excalibur Excalibur? Is it just putting those five characters together on a team? Is it just that they were in England? Is it the tone? Does it have to be all three? It’s something I have thought about for literally years. The thing is… getting the old band back together is not as easy as it sounds, as the characters have all grown apart and gone different directions and I would hate to sledgehammer them back into a book together in a way that read as just nostalgia. If the O5 Excaliburians are gonna get back together, I would want it to make sense. AiPT! : Speaking of former X-books, Zack Jenkins‏ (@XavierFiles) wanted to know what the odds were that we’d get to see the Peter Milligan/Mike Allred X-Statix again? Jordan: Didn’t they all die? I don’t see how that would be possible. AiPT! : And then he drops an eXclusive image… well played, Jordan, well played. OK, since we’re in a nostalgic mood this week, I might as well ask BasketballFanCT’s‏ (@CT_In_TC) question. Jordan, when is Mammomax coming back? Jordan: I don’t know… September? AiPT! : You heard it here first, Mammomax fans! Now, let’s check in with Jumpyshark‏ (@Jumpyshark), who asked what’s the X-Office’s approach toward determining which X-Men characters get focus? How do representation, continuity, sales, writer picks and story potential all factor in? Jordan: The first and biggest factor is writer picks, typically. The writer is the one who has to come up with and tell a story, so them saying what characters they have something to say about and/or would factor into their story in a good way is the main consideration. I think writer picks and story potential are, ideally, the same thing. Once the writer has weighed in on their story pitch and what team they want to use, we will look at what they have proposed and weigh those other elements against it. Sales, for example–we will look at the cast and story, and if a story is being pitched about a team of Mammomax, Doop, Sage, Adam-X and Frenzy, we would weigh all the elements to see if that works. Is the draw of the writer and the hook of the concept that we can pitch the story on enough that it can sell based on those elements alone? If not, we might say, yeah–can you work in Wolverine or Magneto or Jean Grey… but again, we would try to pick the popular character that worked for the story they are telling. The most important element is being able to tell a story we can get behind and making it as good as we possibly can, so all things being even, that will win out. AiPT! : Noah I. Ray‏ (@noah_redhood) had a valid question from one of the X-Men’s… let’s say, more inventive eras, courtesy of writer Chuck Austen. Is it still canon that mutants are immune to AIDS or has that been retconned? Jordan: Real answer: only things that happen in the comics count. So, whatever I say here regarding my opinion on it would not matter, what matters is if there is a comic book that says in the story that that has changed. As of right now, I don’t believe we’ve done a story about a mutant who has contracted AIDS, so I guess that story stands. AiPT! : ororo munroe appreciation account‏ (@aliastager) had a question about the recent Uncanny X-Men #11 and the apparent death of Loa. Will there be any follow-up regarding how she died, especially since she was the X-Men’s only native Hawaiian mutant? Jordan: Right now, I don’t think anyone on the X-Men even knows that she’s dead. AiPT! : Next up, we have a question from Steve green‏ (@Bartlett4potus) regarding possible Marvel collections to come. Any chance that Generation X will have new collected editions come out, or maybe a second X-Factor Epic Collection? Jordan: You know, I actually don’t have anything to do with collected editions of the books, especially older books. We have a separate department that puts together the trades and hardcovers. We meet with them every couple of months to go over the comics we have planned and discuss how we think they would best break into collections, but in regards to the older material they put out I don’t have a ton of insight into their decisions. I assume sales enter into it, obviously, and they seem to put out collections relevant to big new series or TV shows or movies, but I am not looped in on any of that, I find out about them when they appear in our Previews catalog. AiPT! : Our final three questions this week are all about X-romance. First, mm‏ (@moxie329) is curious to learn what your favorite and least-favorite X-Men love triangles are. Jordan: Least favorite is the one that has completely made me hate Colossus forever, which is Kitty/Colossus/Zsaji. It’s not that he cheated on her that makes me hate him… it’s that he claimed to be in love with Zsaji, this woman who he barely knew, who didn’t speak his language… and he broke up with her over it. I think it’s so much worse than him cheating. If he cheated, he could admit that it was wrong and promise to never do it again. But no, he FELL IN LOVE WITH SOMEONE ELSE. He showed that he is untrustworthy! He said he loved Kitty, but he was either lying or fooling himself, because he fell in love with the first alien lady who walked his way. The idea that she EVER took him back is bananas to me. I am so glad she ditched him. Best one was definitely Captain Britain, Meggan and Nightcrawler, back in Excalibur. Nightcrawler and Meggan are both so charming and likable that even though she and Brian were in a relationship for so long… you just could not fault them for their attraction. Meanwhile, Brian was going through stuff and acting like a jerk, so it really looked like he might lose her. Man, that book was great. That said, at this point, Meggan and Brian are married with a daughter, so I can’t see the triangle popping back up right now. AiPT! : Thanks, Jordan–and thank you for those two eXclusive images! Next, Adina Ryter was wondering if there’s any hope of Storm and Wolverine getting back together. AiPT! : Hm, could that mysterious figure drinking with Logan in this eXclusive image be Storm? Or someone else? Our final love question comes from Vendetta‏ (@Eman419Boyd), who asked if Cyclops could stay single for the whole year. Wait… did this come from Vendetta or Nate Grey? Anyway, thoughts on Scott’s love life in 2019, Jordan? Jordan: No, it is not possible for Cyclops to stay single for a year. He radiates a sexuality made out of concentrated angst and no matter where he goes or what he does, he cannot stay single. At a school with one woman in it, he hooks up. Becomes a boat captain, he hooks up. Moves to Alaska, he hooks up. Leaves his wife and son, he hooks up. He stands over his wife’s grave immediately after her death, HE HOOKS UP. It’s physically impossible for him to stay single. AiPT! : And there he is in another eXclusive image… thinking about hooking up. That’s it for this week’s X-Fan questions, but I’d like to stick with the romantic theme for a question of my own… because if there’s one thing the internet needs, it’s a little more love. So, forget for a second that you’re happily married and let us know… which X-character would be the most fun to go on a date with, in your opinion? Jordan: So, my first thought was, as always, Kitty Pryde because I was so completely in love with her when I was young. But, like… here’s the thing… that really does not work anymore because I am way too old for her. When I fell for her, she was an older woman, but now I am nearly twice her age. So… if I was age-appropriate, her. AiPT! : And finally, what’s the one song X-Fans should be listening to this week? AiPT: Well, that’s it for this week’s–oh yeah, I promised an eXclusive first look at classic X-artist Whilce Portacio’s cover to Uncanny X-Men #19, didn’t I? And you know what? It keeps with that whole love theme… or maybe doomed love. You’re welcome, Emma Frost fans. Of course, we all owe Jordan a big thanks for that image and another week of answers! Also, thanks to all the X-Fans who submitted questions. We’ll start to collect new questions for Jordan to answer tomorrow (Tuesday, March 12) on our Twitter page–so get those questions ready and be sure to report back here next X-Men Monday! Hey Scott, you looking forward to catching up with your ex?